Straight Leg is the New Skinny? 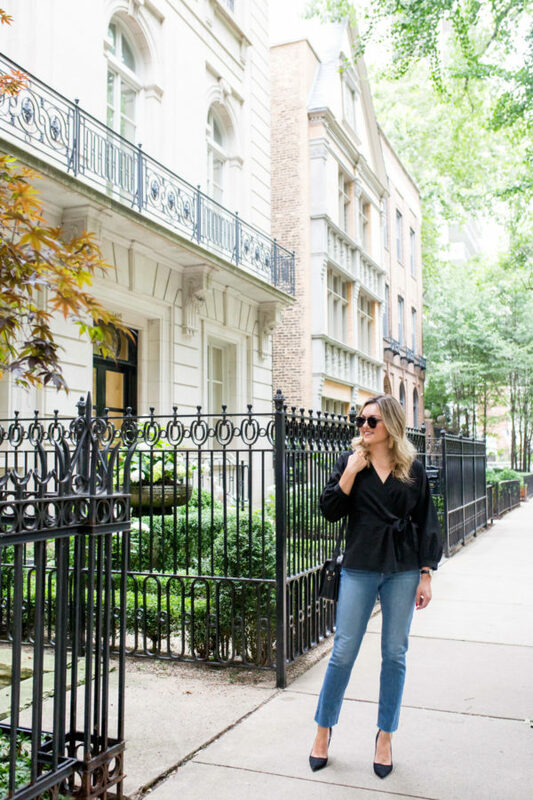 Sharing a few more finds from the Nordstrom Anniversary Sale today! I mentioned it in this post, but these jeans were my favorites out of the 20+ pairs I tried on that day. I didn’t buy them that first day, but I couldn’t get them out of my head so I went back and bought them the next day… They really do fit incredibly well! 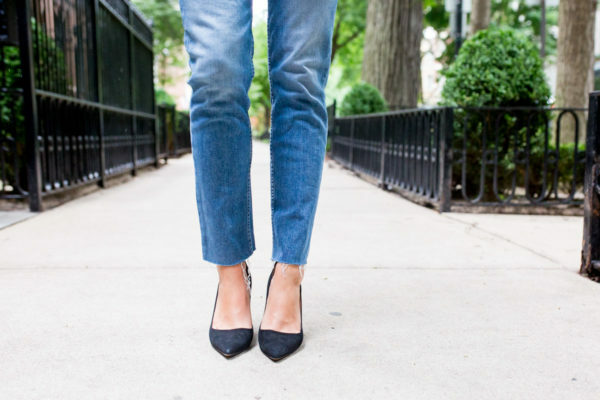 I feel like it’s hard to find straight leg jeans that are just right, but these are it for me. Instead of styling them in a more casual way, I figured I’d dress them up for a more work-appropriate outfit! 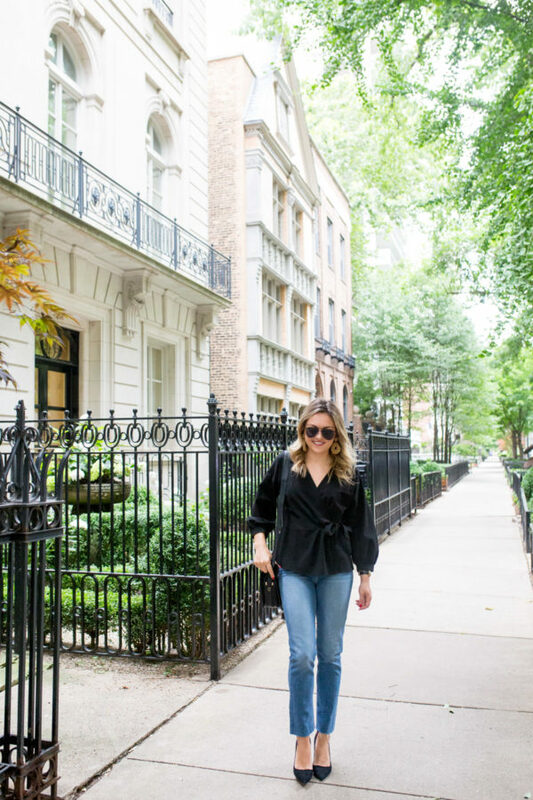 Whether denim is a Casual Friday only occurrence in your office or you can rock them all week long, a pair of straight leg jeans looks super chic. 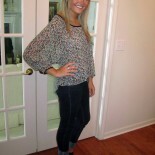 While skinnies will always be classic, I’ve personally been gravitating away from them lately. I think a straight leg looks a lot more elevated! 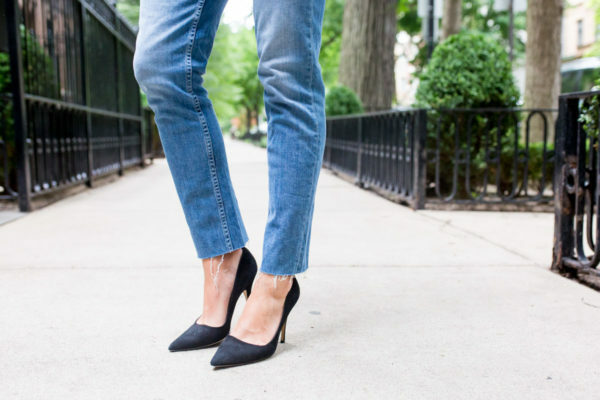 The slight raw hem on this pair looks so perfect with pointed toe pumps, too. PS: They fit TTS! I’m wearing my normal jean size, 27. On top, I went with something with a bit more volume — this wrap top with ballooned sleeves that’s so easy to throw on. It’s made for the office, but doesn’t look too stuffy once you leave work and meet up with friends later. For sizing, I think it fits TTS in terms of their size guide! I’m wearing a small, which fits a 4-6. If you’re in between sizes, I would size down! You stand out as do down to earth. I turned 30 & am having a hard time with my shopping decisions confidence. Do you have any advice on how to make shopping decisions after the 20’s? Have you turned 30 yet & if so when? Aw thanks, Jenn! That’s so sweet of you to say. I’m about to turn 29 this month so I have not hit 30 quite yet. What specifically are you struggling with? In my opinion, age really is just a number and you should always gravitate towards what you feel good in. Feel free to shoot me an email — hello (at) bowsandsequins (dot) com!